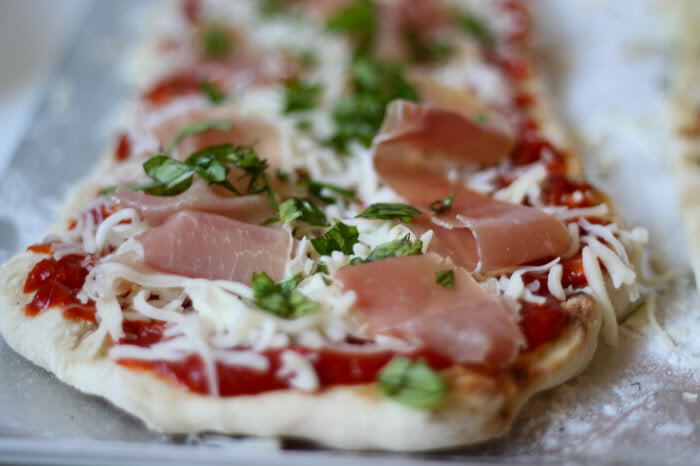 Grilling pizza is of course delicious, it’s also crazy easy, a good way to use up random what-nots from your refrigerator, and a super fun activity to do with your kids. We love grilled pizza so much, and there’s just one little trick to having a perfect grilled pizza every time. Also, we always make our own pizza sauce, because the recipe is just about as easy as buying pre-made pizza sauce, but less expensive. We have been enjoying a lot of potato pizzas lately (with dill, yum), but also usually do one traditional grilled pizza for the little lady. First you’ll need dough. This is a great recipe, but we usually stock up on pre-made pizza dough from Trader Joe’s, which makes grilling pizza extra convenient. You might be tempted to use marinara sauce as pizza sauce. I say, don’t. Marinara sauce is much thinner than pizza sauce and tends to make a pizza soggy and is less flavorful then a rich, thick pizza sauce. So if you want a traditional pizza sauce for some of your grilled pizza creations, make this super quick one, and feel free to jazz it up with any spices you like, though we usually throw our herbs on the pizza rather than in the sauce. Here’s is our easy-peasy pizza sauce recipe. Dice up a couple cloves of garlic. Heat 2 or 3 tablespoons of olive oil. Toss in the garlic and cook until fragrant. Don’t let them burn. Pour in a 28 ounce can of crushed tomatoes (or crush your own garden tomatoes and add them). Let simmer for 15 minutes or so until nice and thick. I store my pizza sauce in a mason jar with a dated label in the fridge. It will last about a week (or you can actually can yours and have it for a year or so). Okay, so stretch/roll out your pizza dough. I never get hung up on making a perfect shaped pizza. I prefer a few small, long, thin pizzas so everyone can add their own toppings and they slide easily on and off the grill. Place your crusts on a lightly floured cookie sheet (or pizza peel, or the back of a cookie sheet if your cookie sheets have rims). Do not top your pizza yet! If you do, it will be soggy, blech. Instead, heat the grill and oil it (the easiest way to oil the grill without starting a flare up is to moisten a crumbled up paper towel and rub it on the grill). Slide your pizza crusts on to it. Remove from the grill, with the side of the dough with grill marks facing up. I always start with a dusting of parmesan cheese, it gives the crust a nice flavor and melts on with the warmth of the pizza dough. At this point you can do whatever you want. Here I did one pizza with our homemade sauce, and one with olive oil. Mozzarella and prosciutto with basil. Mashed potatoes (or even better, mashed sweet potatoes) in place of sauce. With diced eggplant, mmm. Roasted veggie puress used in place of sauce are so good too. Roasted garlic (pre roast the cloves) and salami. Salami on pizza makes me so happy. BBQ sauce with chicken or sliced beef. Enchilada sauce with carnitas. I mean the list goes on and on. Close the lid and let them cook for about 6 minutes or so, until the bottom of the crust is browned and the cheese is bubbly. Yes, I let her eat pizza in my bed. With a white duvet. Yes, I regret that decision. YUM! Garden fresh basil is the best on homemade pizza! I'm going to try adding roasted garlic to my pizza sauce. I usually just add oregano/basil/parsley to tomato sauce, although sometimes I season the dough and not the sauce. Anyway, thanks for the tip on grilling the dough first and for using the word "blech." I love that word and my husband thinks it's funny I use it. this looks delicious – I've made gluten-free pizza on the grill before, but I had to use parchment under the dough since its so soft…but I never thought to pre-grill then add the toppings. Going to try that next time! Such a sweet smile! I'm definitely going to move our Friday night pizza to the grill this summer (in Australia). No more heating the house up for delicious homemade pizza. Thanks for the tips and topping suggestions. I keep putting the same old things on and am looking for a change. Cutest child of all time. Pizza looks great. I am now going to have to have a piece for lunch. What temperature do you heat your grill to? I’ve been afraid to try, just in case I totally char the pizza, and have unhappy, hungry, whiny kids, and a hungry, unhappy, whiny mom, too! well we have a gas grill and i turn it to medium high. so that’s probably not helpful is it? = ) I say Blech too and Plbb = P Only Olive Oil, Garlic and Crushed Tomatoes?! I guess I’ll have to try it! Love this tutorial. Thanks for all the great tips and pics. I can’t wait to try this tonight!